Cheap Wireless Plan | A Savings WOW! This past month, Jim and I have been trying out the Walmart Family Mobile program with its unlimited text, talk, and web plan to see if it would be a good option to use with our kids as they are now getting to the age of wanting a cell phone. We also wanted to compare it with how it stacks up against our traditional cell phone plan, since they are both powered by T-Mobile. 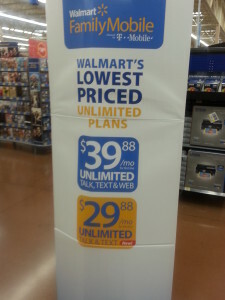 – The cost of the Walmart Family Mobile program with unlimited text, talk, and web is $39.88 versus the approximately $65.00 per line contract plan that we have now. Over the year, it would add up to big savings for our family. – We have had no problems with getting service using Walmart Family Mobile program. It’s worked well for us in our home, visiting friends/family, in restaurants, and on the road. 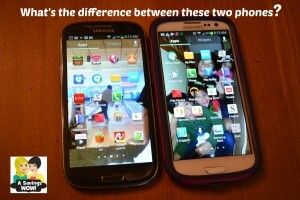 – Jim was able to use the SIM card on his Samsung Galaxy SIII with no problem. 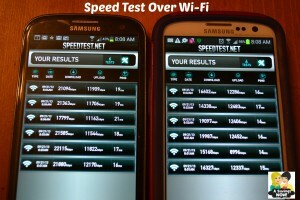 He ran a Speed Test with the SIM card in his SIII and compared the results to my Samsung Galaxy SIII, which is on a traditional T-Mobile contract plan of unlimited text, talk, and web. I was surprised to find that the Walmart Family Mobile plan actually had some better results than our traditional T-Mobile plan when we used Wi-Fi. As you can see in the photo below, the results showed the Walmart program had 21094 kbps vs 16604 kbps on the T-Mobile program for download speeds and the Walmart program had 11909 kbps vs 12286 kbps on the T-Mobile program for upload speeds. 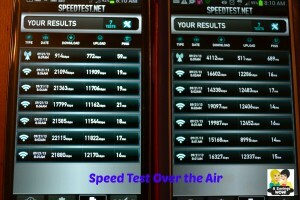 – We did see a bit of a bigger difference in speeds when the connection was over the air versus Wi-Fi. As you can see in the photo below, the results showed the Walmart program had 914 kbps vs 4112 kbps on the T-Mobile program for download speeds and the Walmart program had 772 kbps vs 511 kbps on the T-Mobile program for upload speeds. It just depends on what you are looking for as far as features of a cell phone program whether this one is right for you. We have been pleased with our experience with the Walmart Family Mobile program so far. One of the biggest conveniences is having online account management and information. It can be a true budget saver for families because you know upfront what the monthly cost will be and if you decide it is not for you, you have the ability to stop the plan when you are done, instead of waiting for a contract to end or having to pay a huge penalty to end a contract. We think it’s definitely a good way when having your kids start off with their own cell phone to be able to manage their cell phone costs by having a plan such as the Walmart Family Mobile program. What other ways have you cut your cell phone bills? Let us know by leaving a comment.